1 IF YOU LOVE MY JESUS (Loud) Stand up and shout it If you love my Jesus. Stand up and shout it If you love my Lord. I want to know, Oh, I want to know, Do you love my Lord. 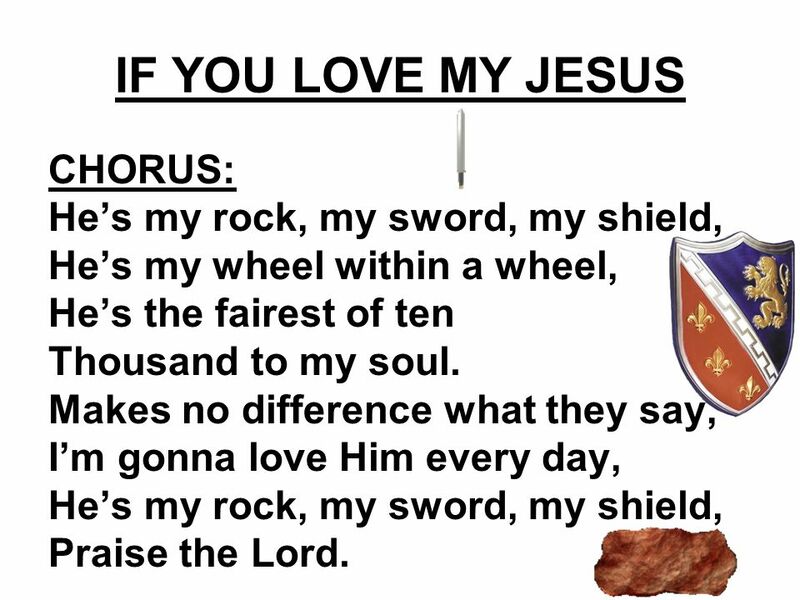 2 IF YOU LOVE MY JESUS CHORUS: He’s my rock, my sword, my shield, He’s my wheel within a wheel, He’s the fairest of ten Thousand to my soul. Makes no difference what they say, I’m gonna love Him every day, He’s my rock, my sword, my shield, Praise the Lord. 3 IF YOU LOVE MY JESUS (Soft) Sit down and whisper If you love my Jesus. Sit down and whisper If you love my Lord. I want to know, Oh, I want to know, Do you love my Lord. 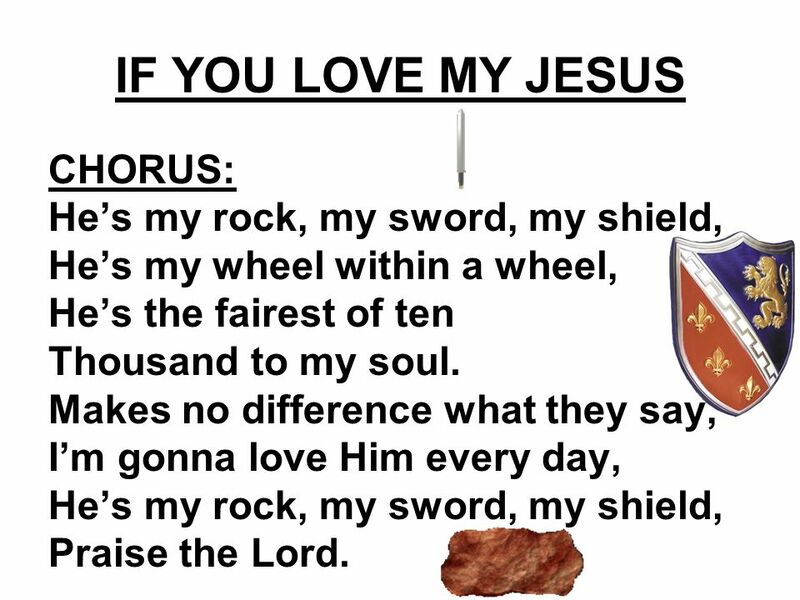 4 IF YOU LOVE MY JESUS CHORUS: He’s my rock, my sword, my shield, He’s my wheel within a wheel, He’s the fairest of ten Thousand to my soul. Makes no difference what they say, I’m gonna love Him every day, He’s my rock, my sword, my shield, Praise the Lord. 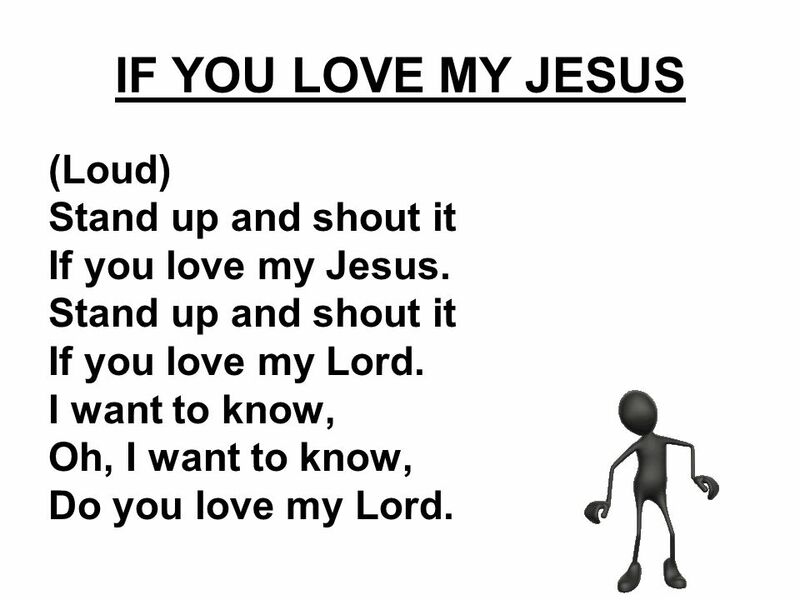 Download ppt "IF YOU LOVE MY JESUS (Loud) Stand up and shout it If you love my Jesus. Stand up and shout it If you love my Lord. I want to know, Oh, I want to know,"
Everywhere I Go. I cannot contain what Youve done in me I cant stop lifting up my praises to You My Jesus. I’m gonna sing, sing, sing! This is the day, this is the day That the Lord hath made, that the Lord hath made. We will rejoice, we will rejoice And be glad in it, and be glad in it. All Around Your Throne There are angels singing All around your world There are people singing Holy, Holy, Holy is the Lord. Obey the Spirit I'm gonna sing when the spirit says sing Hallelujah gonna sing When the spirit says sing Yes I'm gonna sing When the spirit says sing I'm. I'm gonna view that Holy City. Oh, I'm gonna view that Holy City one of these days. I'm gonna view that Holy City. I'm gonna view that Holy City, view.